Well that's it. September's here and summer's over! Normally a depressing thing to contemplate but for the fact it heralds the football season proper as the games come thick and fast, a chill starts to tinge the air and midweek games start to be played in the dark. Hmmm maybe that is still a bit depressing but anyway enough of that. How was your international break? Did you make the most of it or grumble on the sidelines with your hands over your eyes and earplugs in pretending there was 'no football on'? After a bit of umming and ahhing I opted to attend the Game4Grenfell over Harrow Borough's FA Cup tie at Enfield Town. On reflection it looks like I made the right choice as Boro bowed out to a late goal meaning any chance of repeating last year's glorious run to the first round ended at the first attempt. 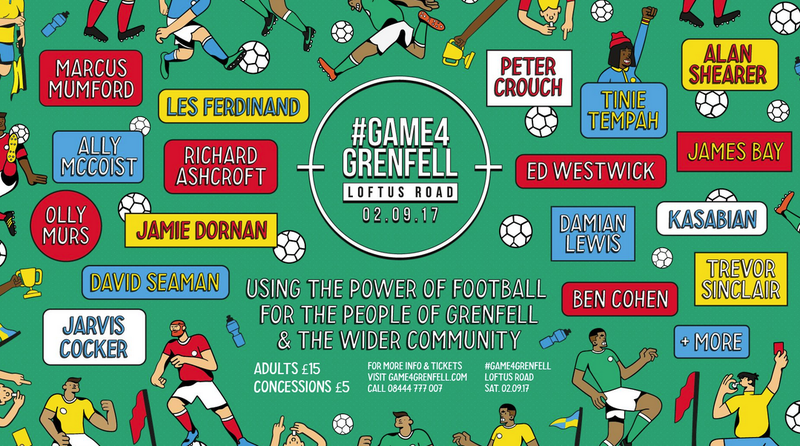 The charity match for survivors of the Grenfell Tower fire had received increasing amounts of publicity all week with new participants revealed as kick-off approached. 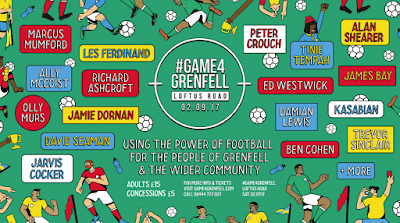 We already knew a host of ex-pros, TV presenters, pop stars and Game of Thrones actors would take part but then we were told running leagend Mo Farah would take part and there would be a half-time show with Haringey Borough fan Emile Sande (I think she's a singer too) and Rita Ora. Arguably the biggest coup of all was revealed the night before when Manchester United manager Jose Mourinho said he would play too. Thankfully I'd bought my tickets in person in advance so could just walk in because the queue for collection at around 215pm on Saturday afternoon was the longest I have ever seen it in my 34 years of going to QPR. As a result many of the close to capacity crowd missed kick-off. I've mentioned before on here that I'm not really into celebrity games like this as the quality of play is usually a bit iffy. The most notable thing from my point of view was how much slower than professional football the pace was and the power of the celebs' passes and shots was also clearly lacking. Despite his spindly frame and lack of shot power, it was Farah who opened the scoring for the side managed by Les Ferdinand right at the start, sweeping home a loose ball after a mix up in the penalty area between former England keeper David James and some of his defence. Captaining Alan Shearer's side was Trevor Sinclair who scored twice during the game to show he still has plenty about him. The other ex-pros to catch my eye included Stan Collymore who barely got out of second gear and could have had a hatful of goals if he hadn't continually tried to set up some of the firefighters or Grenfell survivors who were also given a run out. Paul Merson was also impressive despite the significant amount of excess baggage he'd stashed in the hold and played plenty of those trademark passes he used to make with the outside of his foot. However, the show was ultimately stolen by Mourinho who emerged from the bench with half an hour to go to replace David James in goal for Shearer's side. Being a former Chelsea manager he was booed loudly by the QPR supporters in the crowd as he took his place between the sticks in front of the Loft. Unperturbed, the Special One had to immediately deal with a corner which he punched clear with some aplomb. 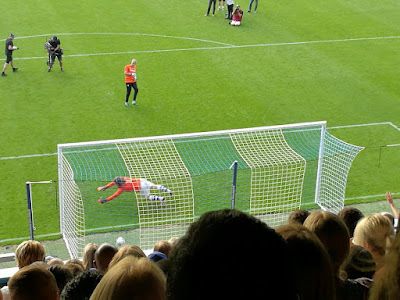 For the remainder of the game he played the ultimate pantomime villain - remonstrating with the referee, getting booked for time wasting and generally winding up the crowd. The Portuguese supremo did get beaten once but was generally pretty handy, making a couple of saves and kicking very competently too which when you consider he never really had a playing career was no mean feat. With the game ending 2-2, a penalty shoot-out was announced but proceedings were held up by a pitch invasion which was the only blot on the afternoon. Although it was almost made up entirely of children, the match was close to being abandoned which would've been a great shame. The shoot-out did eventually proceed with the kicks largely taken by firefighters and survivors apart from one by Mourinho which he tucked away deftly and the winner from singer Olly Murs to give Team Ferdinand victory. With a lengthy half-time, the whole match lasted nearly three hours but it still provided great entertainment for all. With fans of all local clubs in evidence around the stadium and mascots from Arsenal, Spurs and Reading coming into the area too it was a great way for football to remember, celebrate and support all those involved in the tragedy. 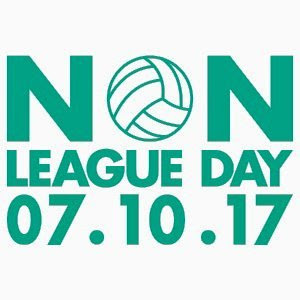 The rest of my week has been spent preparing for Non-League Day which is now just over a month away. The last few days has been all about sending out press releases, launching a special offer and starting a new relationship with one of the leagues in Scotland as we look to make meaningful progress there for the first time. Over the next few days there'll be a lot more social media work and another meeting with our charity partner Prostate Cancer UK. In other news, my daughter will also be starting school (some long time readers might remember her being born) and I've got to squeeze a load of half marathon training in, including a 10-mile run tonight. There are over 90 matches in the London area over the next seven days as the Premier League and EFL make their return. There are also a few FA Cup replays and the opening round of the FA Vase too. Arsenal v AFC Bournemouth @3pm - the only top-flight game of the week takes place at the Emirates Stadium where a troubled Gunners side welcome Eddie Howe's Bournemouth. With only one win from three, Arsene Wenger and his charges are already under huge pressure to get positive results and if it all goes pear shaped against the struggling Cherries then all hell could break loose!